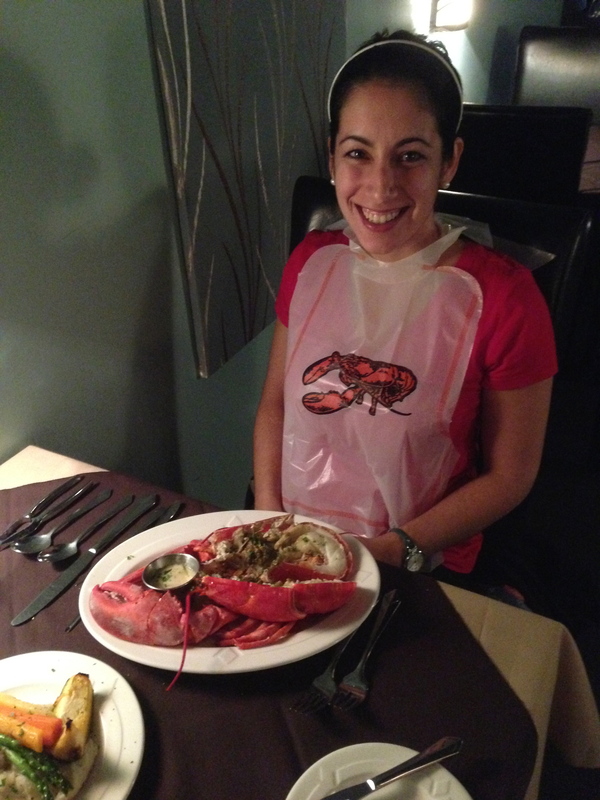 I was told that if I was going all the way to the maritimes, I HAD to try lobster – So I did. 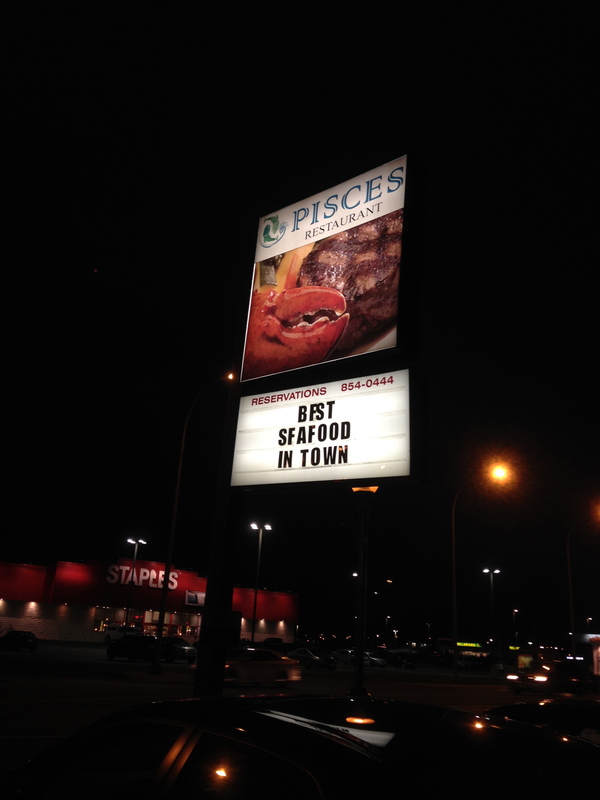 It was only a matter of steps from my hotel to the restaurant, and as the concierge had proclaimed, the sign out front read: I later discovered that Pisces is actually ranked the 7th best seafood restaurant in Moncton on Urbanspoon, but I guess thats close enough. 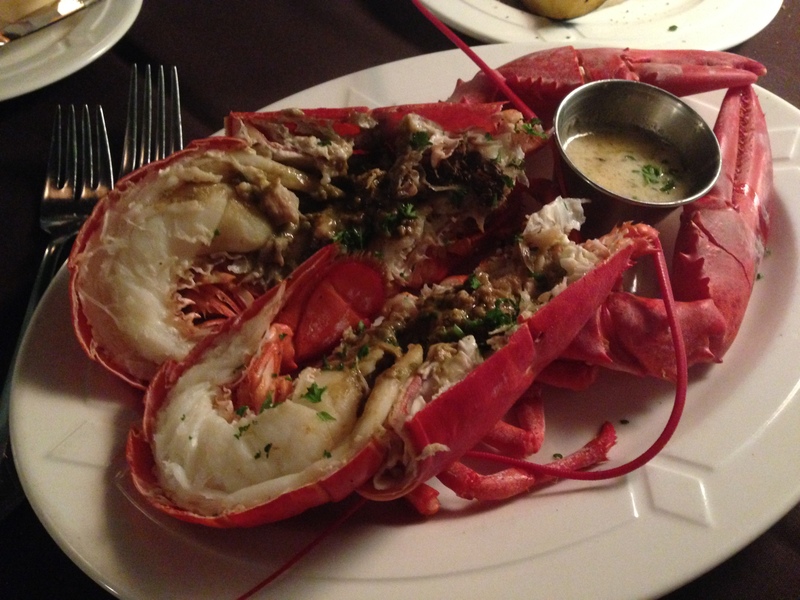 Before I sat down I already knew what I wanted – lobster and a glass of water. “Ah, the Lobster is very good,” said my waiter in a heavy french accent, before ducking back into the kitchen. First he brought out the utensils, which included no less than eight different tools! “Ummm… So what do I do with all this stuff?” I asked. He explained that the the utensil on the right was for cracking the shell, the two-pronged fork was for picking out the meat, and the longest one was for getting inside the skinny legs. He then demonstrated how to tie on the plastic lobster bib (this step I probably could have figured out on my own). He assured me that the bib was optional, but a good idea as it would prevent my shirt from “getting smelly” if I spilled anything. I didn’t want to risk being smelly, so I bibbed-up. And then came the lobster. I had no idea how challenging it could be to eat a lobster. I wasn’t sure where to start, or which parts could be eaten, and I felt rather sheepish when asking for instructions. My server explained that all of the “bad parts” like the heart had already been removed and that I could eat anything I saw on my plate. I was still rather suspicious about the brown stuff in the middle, and left that part behind. Later that night I Googled ‘What is the brown stuff in a lobster.’ There were a variety of results, but Wikipedia said that it is the liver/pancreas, and is sometimes called Tomalley. You can eat it, but it seems that I am not the only one who prefers not to. My favourite part of the lobster was the tale and the claw. Incidentally, this was also the easiest meat to get to. On the other hand, I really struggled getting the meat out of the long skinny legs. I had difficulty manoeuvring the tools and the cracker seemed too large for the petite joints. I was thankful that my section of the dining room was empty so no one could watch me in combat with the tricky crustacean. Hopefully I will do better next time. On the menu, the lobster was listed at market price. I would always recommend asking what market price is that day in advance, because the lobster on its own was a whopping $46.00! While I wouldn’t rank lobster as my favourite food, it was definitely tasty and I did enjoy the experience. It was a messy business, and something that I would not recommend for a first date… or a second date. Ummm . . . are you there now? Great reading. I love lobster — but like you, not the innards!!! No, I was there a few weeks ago Wanda – just catching up on my blogs! Today I am in Victoria BC, and will be posting about the west soon! Good job you weren’t trying to feed a family of 6 at those prices! Sounds like it was a tasty meal! Yikes – a family of 6 would be a big bill! You cut a pretty picture all bibbed up! You describe the experience so well. I was fortunate to eat lobster tail on west coast of Namibia, still remember the taste, gorgeous. Wendy, I am glad that you also got to experience this unique cuisine! The tail is definitely the best part!